We also have with us extensive industry experience in successfully handling the demands of sauna equipment that helps in toning up of the body as well as assist in removing excess fat. The operation of sauna is based on generating heat in an enclosed room so as to elevate temperatures, usually above 135 degrees Fahrenheit (60 degrees Celsius). While enjoying the dry sauna, sauna bathers can sit/lie in sauna to absorb warmth that helps in elevating internal temperature, stimulating blood flow as well as opening up of the pores. A sauna is a small room designed to be heated to very high temperatures, with well-controlled humidity. Saunas are used both for recreational and therapeutic purposes, with most people utilizing them as a relaxation tool that provides additional health benefits. Sauna Room is constructed using a framework of pine wood cross-sections. The entire surface is covered with resin bonded high-density glass wool wrapped in aluminium foil. The entire frame is sealed with waterproof, fireproof, termite resistant & seasoned plywood. The inside of the sauna room is then covered on all six sides (including fl oor & roof) by pine wood strips using tongue & groove joints. Popular residential sauna sizes are the 5'x7' and 6'x7'. The top bench is 7' long and easily seats four persons and is long enough for 1 person to lay down. 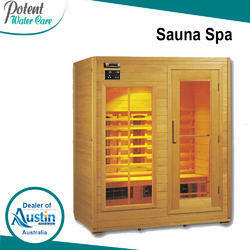 These residential saunas are generally rated as 3 people, 4 people or 5 person saunas. The best sauna height is 7' high on the inside with a 2-level bench layout. Sauna is becoming a regular element in hotels, swimming pools, sports clubs and gyms. To maintain the image of a successful business any company certainly must have a sauna suite of its own. For commercial saunas, the sauna room sizes of 6 x 8, 6 x 10, 8 x 8 and 8 x 10 are very popular as they can seat as many as seven to ten persons at a time. 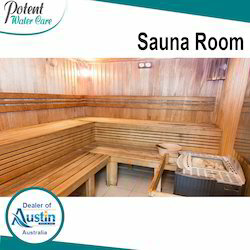 Reviving the values of traditional sauna bathing, AUSTIN brings the most modern saunas to you. Crafted with seasoned wood panelling and thermally insulated walls come with comfortable benches & chairs and wooden door with all luxuries. The sauna heater is usually installed in a corner of the sauna room so it uses only a small area of the corner. Standard Sauna Heater Includes Controls &Rocks This electric sauna heater model offers good sauna heater features and fast warm-up time at an affordable price. The sauna heater made of 304 Grade Stainless sauna heater. 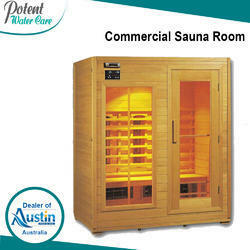 Product Description:We are offering an excellent quality of Sauna Room. It is constructed with fine pinewood. The wood is treated seasoned before use. Sauna room is thermally insulated. Construction is done in the same way as of supremo. It has the wood panels on both sides(inner outer). The worldclass luxuries like water bucket, ladle, heater guard, robe-hook, head rest, sand timer, scrub brush, light cover/grill, sauna rocks thermo-hygrometer. This is a modular unit. It may be shifted from one place to another. The Electric Sauna Heater is usually installed in a corner of the sauna room so it uses only a small area of the corner. Standard Sauna Heater Includes Controls &Rocks This electric sauna heater model offers good sauna heater features and fast warm-up time at an affordable price. 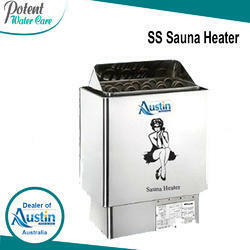 The SS Sauna Heater is usually installed in a corner of the sauna room so it uses only a small area of the corner. Standard Sauna Heater Includes Controls &Rocks This electric sauna heater model offers good sauna heater features and fast warm-up time at an affordable price. The Commercial Sauna Heater is usually installed in a corner of the sauna room so it uses only a small area of the corner. Standard Sauna Heater Includes Controls Rocks This electric sauna heater model offers good sauna heater features and fast warm-up time at an affordable price. Looking for Sauna Bath ?